The Greeks or Hellenes are an ethnic group native to Greece, Cyprus, southern Albania, Turkey, Sicily, and Egypt, to a lesser extent, other countries surrounding the Mediterranean Sea. They also form a significant diaspora, with Greek communities established around the world. Egypt, the Balkans, Cyprus, and Constantinople. Dress professionally. Summer dress is more casual due to the high temperatures. Men wear dark color suits and ties. Women should wear dresses, suits, pantsuits or skirts and blouses. There is no specific dress code. 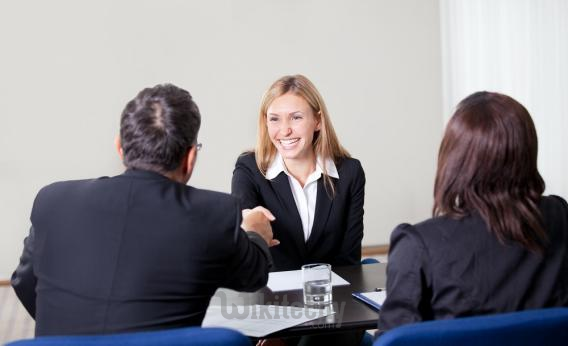 However, it is advisable to dress conservatively in business meetings, a dark colored suit for men and professional outfit for women, preferably in dark or subtle colors, avoiding provocative clothing. In some cases, depending on the situation or business area, less formal clothing is acceptable. In the summer months, the weather is very hot, especially in the big cities; it is acceptable to just wear a shirt with trousers and in most cases to not wear a tie. Women can be lightly dressed, avoiding tight clothing. In Greece, first impressions are based largely on the way one is dressed, so this can make a big difference. Sturdy, comfortable walking shoes are important when walking in Greece as the sidewalks are often rough and uneven. Wear comfortable walking pants and shirts that can be tucked in. Select clothes that are in good condition and are sized properly as well as items that you consider slightly too dressy for everyday wear at home, as Grecian residents often dress more stylishly than Americans are used to. Include a jacket that you can easily carry, when traveling during the winter months. Even though the late Greece's archbishop Christodoulos has stated that anyone is welcome in the Greek-orthodox churches. People should not show too much naked skin. In monasteries women have to cover their shoulders and wear long skirts, and men must wear long trousers. It is sad to see holidaymakers walking into churches and monasteries wearing swimsuits or women covering shoulders wearing a bikini top. 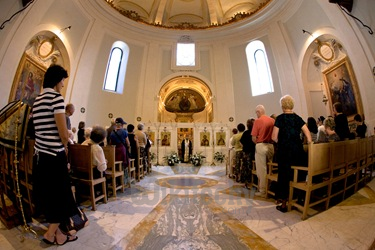 Greeks are in general well-dressed, and you should just think what you would wear in a holy place at home. Most people will have noticed on holiday in Greece that the Greeks themselves almost never walk around that way except on beaches. The young ones though do. The answer is quite simple. Imagine people walking around in bikinis or shorts with bare upper parts of the body in your own hometown or city. It would look a bit strange. It’s got nothing to do with weather. The Greek believe beachwear belong on the beach and nowhere else. They live and work on the holiday-resorts, surrounded by classmates, colleagues, family and friends. Now, as far as the tourists are concerned, they understand our longing for the sun and how we want to relax when on holiday, but they sometimes think we are a little bit vulgar. 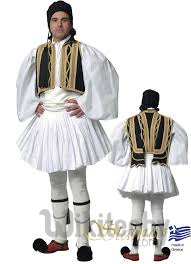 There are 2 main types of Greek traditional costumes: with foustanella (traditional men's skirt or kilt) as a main piece and with trousers as a main piece. 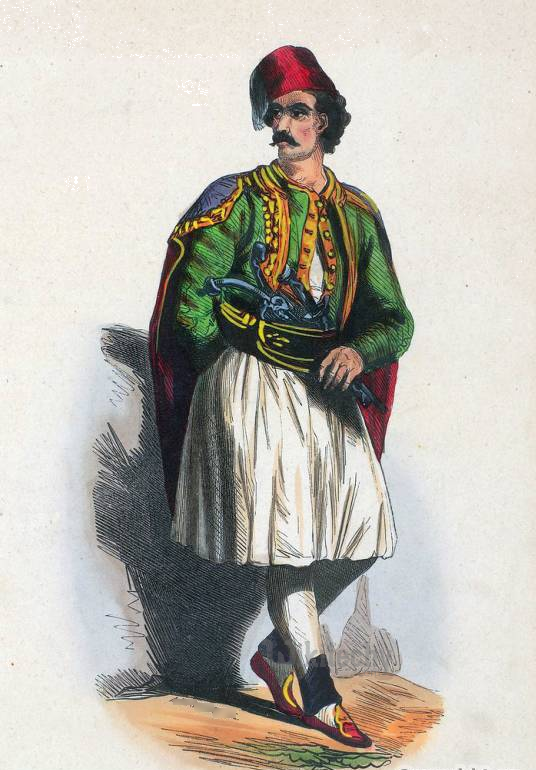 In general, men's traditional attire of Greece consists of a foustanella or trousers (full cut or baggy trousers), a shirt called "poukamiso", a vest called "yeleko" or "meindani", a sash called "zonari", a hat, special leg coverings called "kaltses" and leg garters called "gonatares", and shoes called "tsarouhia". Foustanella skirt is very popular in many regions of Greece. It is a wide and short skirt, knee-length or above the knee-length. Usually, it is black or white. Sometimes it is connected to the upper part of a garment, in other cases, a foustanella is worn like a separate piece. This garment is very interesting and rather unusual for modern Europe. But historically many European countries used skirts as a traditional male clothing. European royalty (mostly men) even used tights, leggings, and stockings. Actually, foustanella is worn in Greece since the 12th century. It's an ancient tradition which is kept even in 21st century. Foustanella skirt consists of 400 pleats which symbolize the years of Greece being under the Ottoman rule. A long chemise called "poukamiso"
A sleeveless vest called "segouni"
An apron called "bodia", a sash called "zonari"
A scarf called "mandili", and shoes called "tsarouhia"
The cotton chemise is the main part of the costume. It can be of any color or print. The vest is usually woolen or velvet. It can be long or short. The color is usually black or white, sometimes with some embroidery at the front part. The aprons are various, often bright and colorful, sometimes woven and sometimes sewn and embellished with embroidery or ribbons. The scarves are large and also colorful. They cover women's head and shoulders. In some cases only face is left uncovered, other women use the scarf to cover only the top of the head, leaving the hair visible. Greek women like to use many layers of clothing. There can be a long shirt, a vest or coat, an apron, and a waistcoat on top. 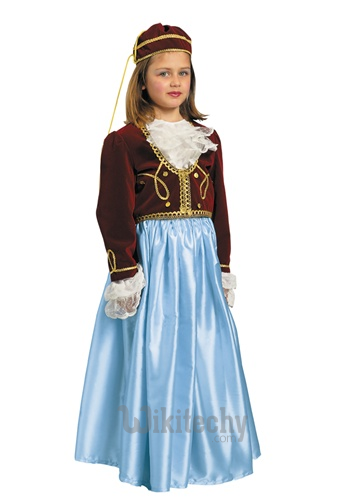 If the costume is for everyday usage, dark colors are often used; the material and patterns of attire are simple. If the garment is festive, then it usually is bright, made from expensive high-quality materials, with embroidery and embellishment. Festive costumes are often complemented with some jewelry. 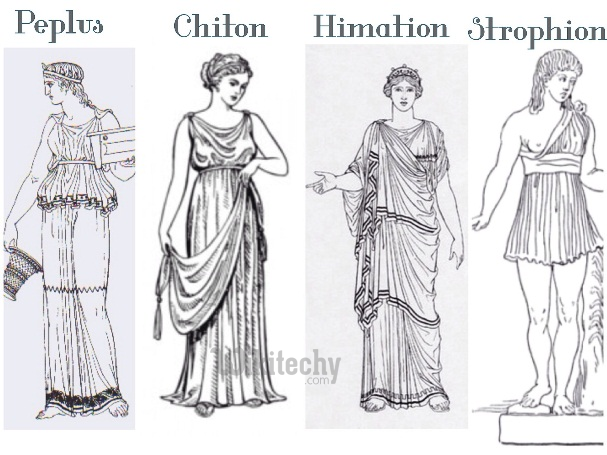 Clothing in Ancient Greece primarily consisted of the chiton, peplos, himation, and chlamys. Ancient Greek men and women typically wore two pieces of clothing draped about the body: an undergarment (chiton or peplos) and a cloak (himation or chlamys). Clothes were customarily homemade out of various lengths of rectangular linen or wool fabric with little cutting or sewing, and secured with ornamental clasps or pins, and a belt, or girdle (zone). Pieces were generally interchangeable between men and women. While no clothes have survived from this period, descriptions exist in contemporary accounts and artistic depictions. Clothes were mainly homemade, and often served many purposes (such as bedding). Common clothing of the time was plain white, sometimes incorporating decorative borders. There is evidence of elaborate design and bright colors, but these were less common. 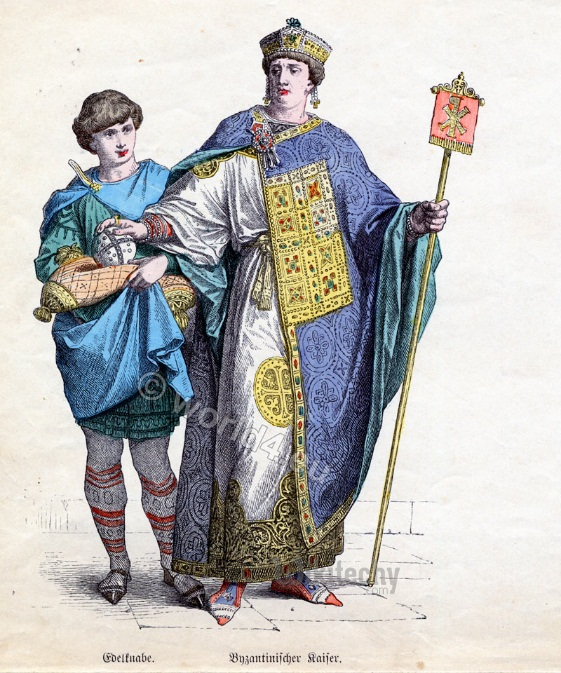 The Byzantine dress changed considerably over the thousand years of the Empire, but was essentially conservative. The Byzantines liked colour and pattern, and made and exported very richly patterned cloth, especially Byzantine silk, woven and embroidered for the upper classes, and resist-dyed and printed for the lower. A different border or trimming round the edges was very common, and many single stripes down the body or around the upper arm are seen, often denoting class or rank. Taste for the middle and upper classes followed the latest fashions at the Imperial Court. As for the colour, purple and Tyrian purple (porphyra) was reserved for the imperial dynasties; other colours in various contexts conveyed information as to class and clerical or government rank. Lower-class people wore simple tunics but still had the preference for bright colours found in all Byzantine fashions. The Byzantine love for colour had its sinister side. The races in the Hippodrome used four teams: red, white, blue and green; and the supporters of these became political factions, taking sides on the great theological issues. Inside the Ottoman Empire, Greeks were part of the Rum Millet. The administrators occasionally brought about legal regulations on clothes (see sumptuary laws). The clothing of Muslims, Christians, Jewish communities, clergy, tradesmen state and military officials were strictly regulated during the reign of Suleiman the Magnificent. Political crises of the 17th century were reflected as chaos in clothes. During the period, each area had its own different clothing style. The islanders, from the westernmost Ionian Islands to the easternmost Cyprus, used to wear the Vraka, a type of traditional breeches. 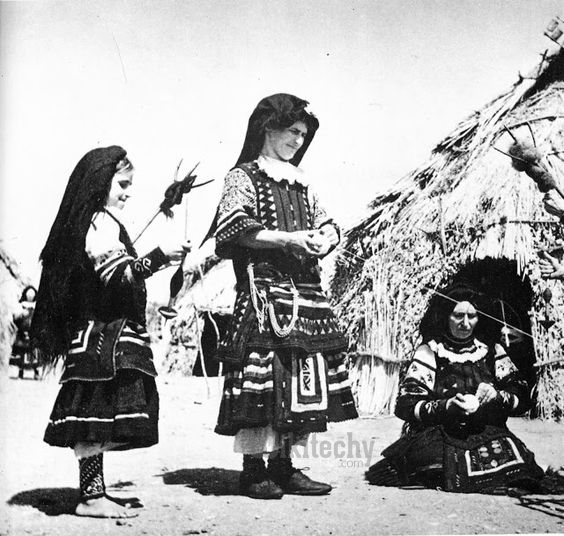 At the rural areas, a popular clothing, of Greek origin, was the fustanella, a traditional skirt-like garment. Fustanella was worn also by the klephts and the armatoloi. Apart from them, wealthy Greeks of the urban centres adopted the Western European-style dress. In the independent Greece, Otto and Amalia were the first to be interested in fashion matters. Amalia created a romantic folksy court dress, which became a national Greek costume still known as the Amalía dress. It follows the Biedermeier style, with a loose-fitting, white cotton or silk shirt, often decorated with lace at the neck and handcuffs, over which a richly embroidered jacket or vest is worn, usually of dark blue or claret velvet. The skirt was ankle-length, unpressed-pleated silk, the color usually azure. It was completed with a soft cap or fez with a single, long, golden silk tassel, traditionally worn by married women, or with the kalpaki (a toque) of the unmarried woman, and sometimes with a black veil for church. This dress became the usual attire of all Christian townswomen in both Ottoman Empire-occupied and liberated Balkan lands as far north as Belgrade. 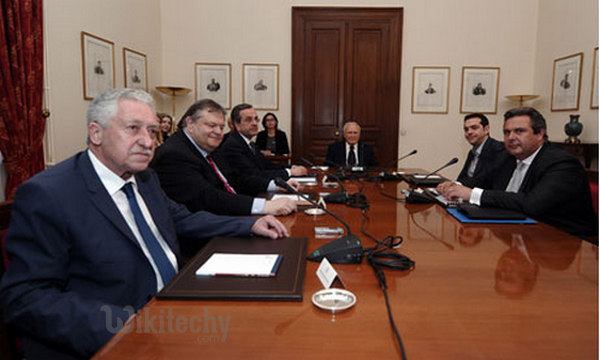 Otto adopted the fustanella for his personal guard, still in use by the Evzones, members of the Presidential Guard. Since then, the Greek fashion follows the European standards. However completely black clothing is worn for one year in mourning. A cliché depicts the mountainous Cretans wearing black trousers, shirts, black stivania (Cretan type of boot), black sariki (Cretan type of woven headscarf), and gold neck chain.